Lemon GreenTea: BOYZ II MEN EXCITED TO PERFORM WITH DIVAS AND VISIT DAVAO FOR THE FIRST TIME! Boyz II Men continues to tour globally, while also starring on their own residency at The Mirage in Las Vegas through 2019. Fall this year, they toured across America as special guests for Bruno Mars’ “24K Magic World Tour” with Charlie Wilson, Ciara and singer Ella Mai. 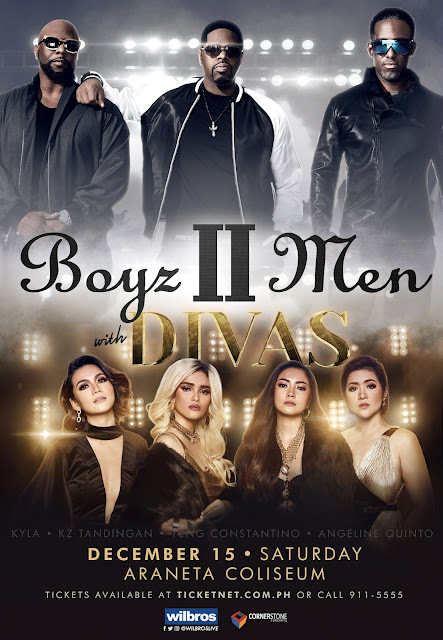 In an exclusive interview, the Boyz share their passion in touring stating “...the fact that we still get to do what we love to do after 17 years, that's fulfilling for us.” They are set to share the stage with the Philippines’ DIVAS in Manila. They will also perform in Davao for the first time, and they are “...excited, and everytime we come to a place and we see the new talent... Actually, that puts us a little bit deeper into the culture because we get the chance to perform with the Philippines' hottest girl group. And you'll never know what comes out of it."